Let us rapidly and inexpensively show you how to get more from your space. Whether your goal is to increase circulation or get patrons to stick around longer, we’ll help you with simple guidance and low-cost tips. When Should I Audit My Space? Don’t put the same old 6′ stacks inside your beautiful new library! We will work with your architects to create an oasis for learning and discovery. Sometimes less is more. We can show you how to use your existing fixtures and shelves to display your collections and increase circulation. All without ripping out the carpet. We will visit your library and walk through the space with you. We will understand how your library is used at different times of the day. 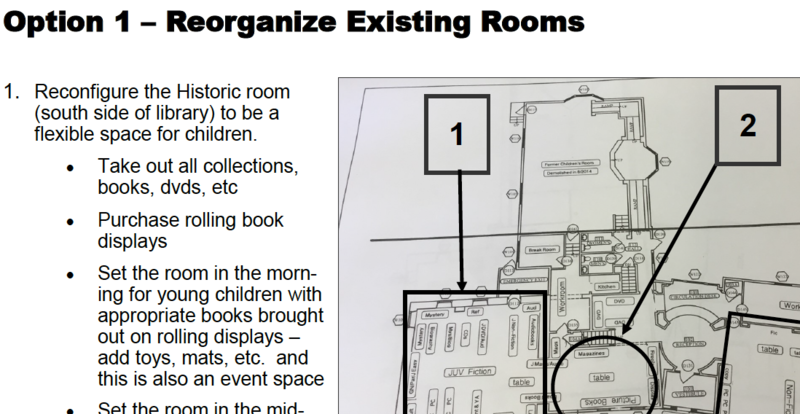 A report giving you specific recommendations tied to pictures and floorplans of your space, along with best practices. When you have our written report, we’ll discuss our recommendations with you and answer any questions you may have. You can order online (below) or call us to schedule a space audit for your library. Before we visit your space, we’ll have a phone or video consultation to understand your situation and your goals for a space audit. We will visit your library and take pictures of your space, then sit down with your library leaders to ask questions. 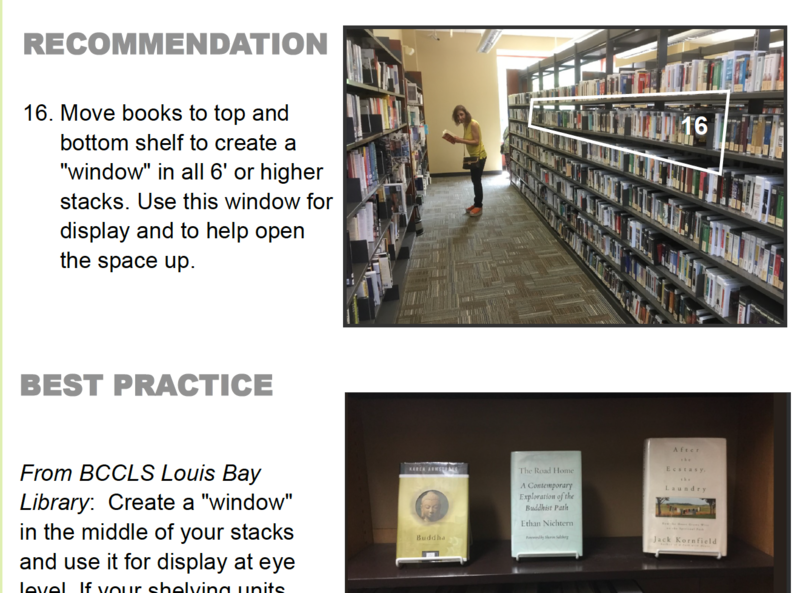 We’ll deliver our report which will include suggestions as well as best practices – all tied to actual photos of your library. When you’ve had a chance to review our report, we’ll follow up to explain our observations and answer any questions. When you renovate, you’ll spend tens or hundreds of thousands of dollars to make your library look better. But are you actually making it more effective? Will your patrons navigate your space more easily? Will they be more likely to pick up a book they didn’t come looking for? Will they learn about new programs or services the library offers? Spend smarter by getting a space audit first. We’ll tell you how to make your space work harder. We will examine how you shelve and display your collections and tell you exactly what to change to increase circulation. We can even study traffic patterns in your library to identify “dead” spaces that are underutilized. If you’re hiring an architect or designer, we can work with them to ensure that your library functions as beautifully as it looks after renovation or new construction. David and his team were great to work with. Their considerable experience in marketing and clear-eyed approach to display and merchandising library materials were insightful. The space audit confirmed some things we suspected and also opened our eyes to exciting new ideas. The audit dovetailed perfectly into our Strategic Plan by highlighting ways to improve our current space with very little cost. It also gives me a great resource to help gather support for bigger changes. Library up to 15,000 square feet (extra charge for larger libraries). Working with Architect/Designer on new structure or addition.